In a search for potential ethanologens, waste compost was screened for ethanol-tolerant thermophilic microorganisms. 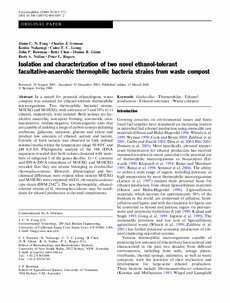 Two thermophilic bacterial strains, M5EXG and M10EXG, with tolerance of 5 and 10% (v/v) ethanol, respectively, were isolated. Both isolates are facultative anaerobic, non-spore forming, non-motile, catalase-positive, oxidase-negative, Gram-negative rods that are capable of utilizing a range of carbon sources including arabinose, galactose, mannose, glucose and xylose and produce low amounts of ethanol, acetate and lactate. Growth of both isolates was observed in fully defined minimal media within the temperature range 50-80°C and pH 6.0-8.0. Phylogenetic analysis of the 16S rDNA sequences revealed that both isolates clustered with members of subgroup 5 of the genus Bacillus. G+C contents and DNA-DNA relatedness of M5EXG and M10EXG revealed that they are strains belonging to Geobacillus thermoglucosidasius. However, physiological and biochemical differences were evident when isolates M5EXG and M10EXG were compared with G. thermoglucosidasius type strain (DSM 2542T). The new thermophilic, ethanol-tolerant strains of G. thermoglucosidasius may be candidates for ethanol production at elevated temperatures.